The world's smallest concert venue, the Klarafestival Box, is visiting the Brussels municipality of Jette next week - including a special day of free concerts for expats on Tuesday 26 March. 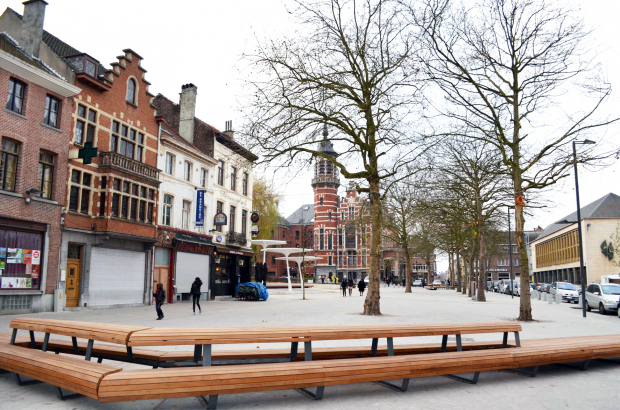 The 15m² glass container has been offering intimate classical concerts for audiences of up to three people at a time since last week - first on Brussels' Place de la Monnaie and now on Avenue Louis Bertrand in Schaerbeek until 24 March. Starting next Monday, you'll find the Box parked on the picturesque Place Cardinal Mercier, in front of Jette railway station. For anyone unfamiliar with the area, Jette in the north-west of Brussels has retained a village feel and is a resolutely green part of town, with a large chunk of it taken up by the King Baudouin Park. More and more expats are choosing to make their homes here, partly thanks to the newly opened tram line 9 and the proximity to Laeken's European School. In a recent Bulletin survey, one Canadian reader told us: "It's on the verge of becoming the Brussels commune par excellence." And just as the Brussels region as a whole is buzzing as a cultural capital, Jette has a solid reputation for art and music, from the Magritte Museum to Atelier 34zero contemporary art space, not forgetting the Jam in Jette music festival every summer. Discover Jette for yourself during the Klarafestival Box concerts from 25-29 March - and grab a seat online before they all disappear. A full schedule of concerts is planned for Tuesday 26 March from 17.00-23.00, specifically for Brussels' international expat community. But, as with all the other days, exact details of who will be performing for you in the Box remain a surprise until the day itself.